Boost your sales with the lightweight ‘influential marketing’ tool for customer enagagement and motivation. show notification with viewers count of current product to push visitor to purchase. Thumbnail image, Customer Name, Customer City, Time Bought and number of items in single order can be shown in the live popup notification with sound (optionally). When you have new orders popping in, they will be shown in real time without refreshing the page. You can turn on the sound option and this will attract even more attention of your site visitors. This creative marketing tool will increase visitor engagement on your website and increase your sales through ‘influential marketing’. or if you have an established store, it will increase help boost your conversions dramatically. 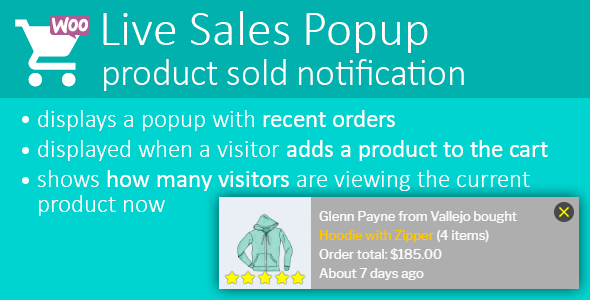 Live Sales Popup is a lightweight but very powerful plugin which works with all WordPress/WooCommerce themes.